Julian Gray is the Executive Director of the Rice Northwest Museum of Rocks and Minerals, in Hillsboro, Oregon and photographed the six fascinating Thunderegg specimens from the Rice Museum’s collection in the recent exhibition featured in Portland International Airport’s Rental Car Lobby titled The Thunderegg. 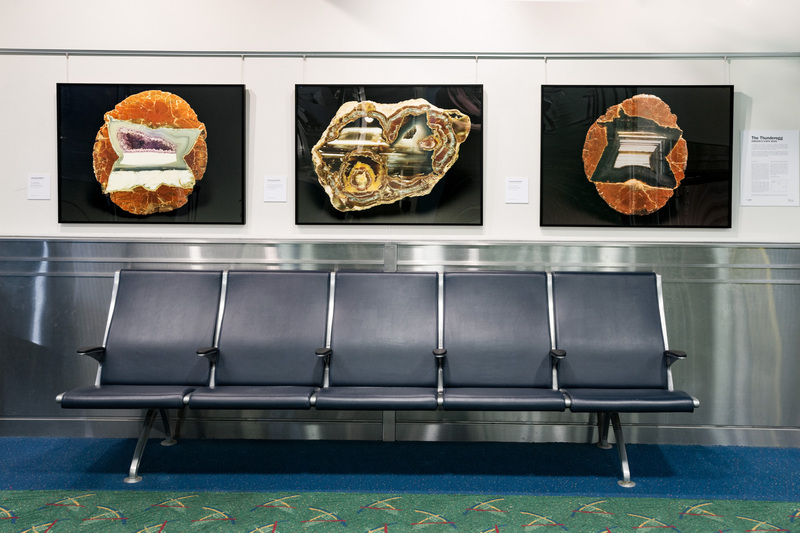 The PDX Rental Car Lobby is the newest exhibition area designated in the airport for the PDX Art Program. Julian Gray started collecting rocks when he was twelve years old. 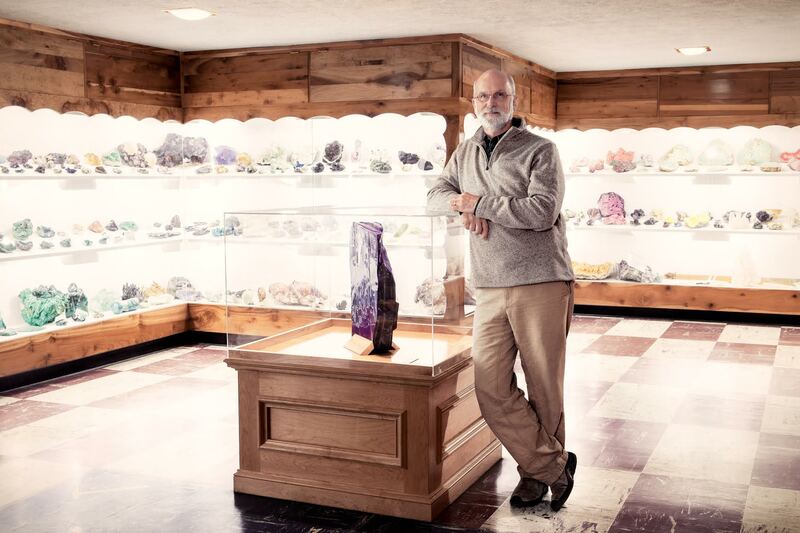 His passion for minerals carried him to Georgia State University where he earned his Bachelor of Science and Master of Science degrees in geology. Julian later worked with the United States Geological Survey and a number of commercial laboratories and environmental consulting firms. He served as curator of the Tellus Science Museum in Cartersville, Georgia for almost nine years before moving to Oregon to take the reins of the Rice Museum in 2014. Julian has happily embraced Hillsboro as his home. He co-authored Minerals of Georgia and the chapters related to Georgia mineral localities for the book American Mineral Treasures. 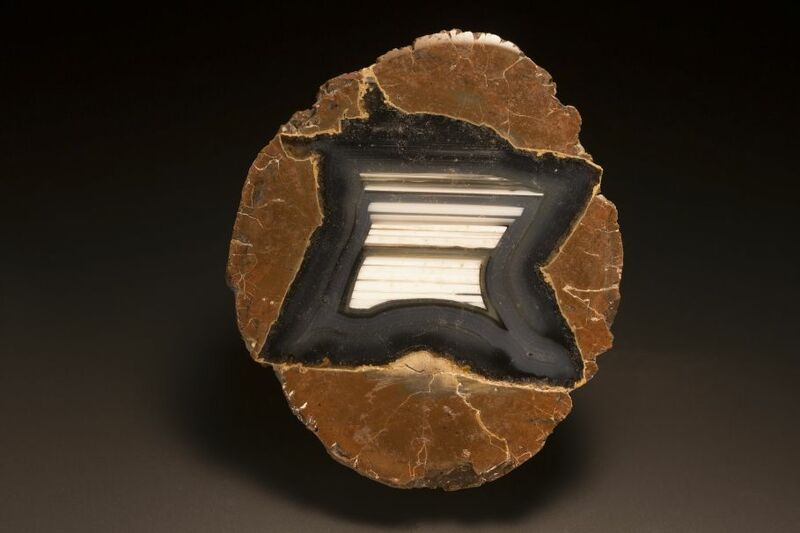 Julian is active with the Society of Mineral Museum Professionals, Oregon Agate and Mineral Society, Columbia Willamette Faceter’s Guild, Friends of Mineralogy, and the Tualatin Valley Rock and Gem Club. 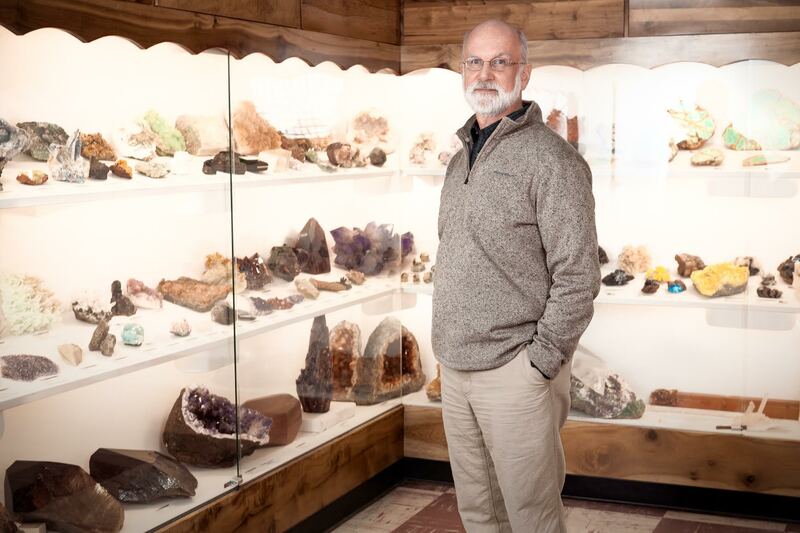 He loves sharing his extensive knowledge and experience of mineral collecting with others using his photography and through many lectures, symposia, and magazine articles. 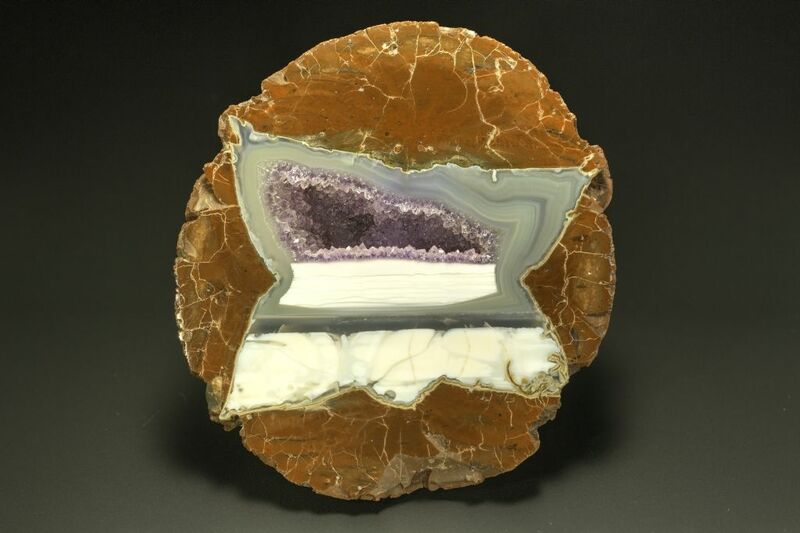 A thunderegg (or thunder egg) is a nodule-like rock, similar to a filled geode, formed within rhyolitic volcanic ash layers. 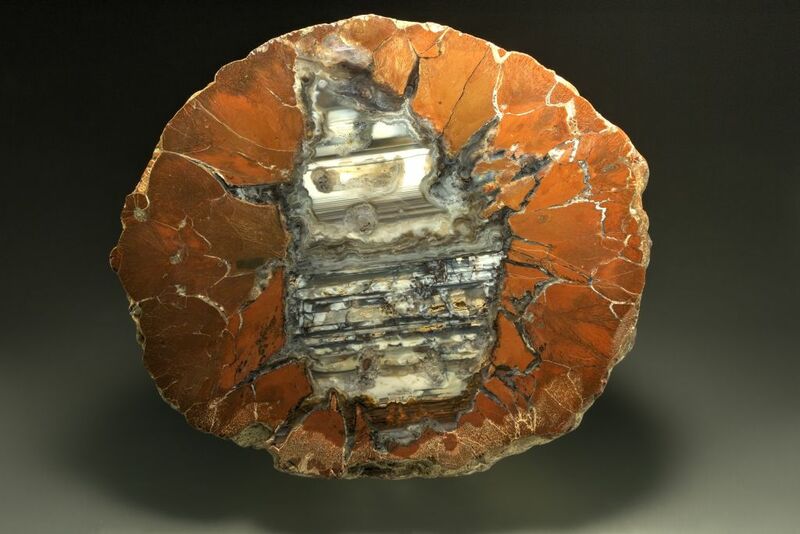 Thundereggs are rough spheres, most about the size of a baseball—though they can range from less than an inch to over three feet across.Thundereggs usually look like ordinary rocks on the outside, but by slicing them in half and polishing them, they may reveal intricate patterns and colors. 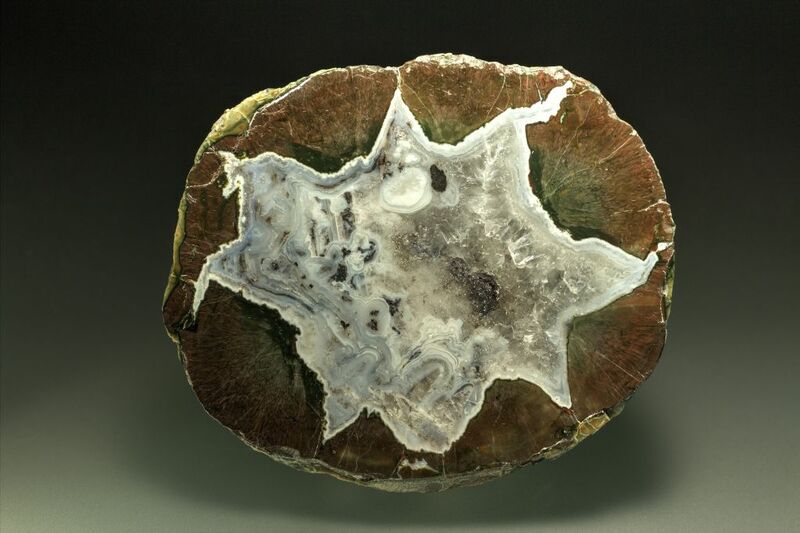 On March 30, 1965, the thunderegg was designated as the Oregon state rock by a joint resolution of the Oregon Legislative Assembly. While thundereggs can be collected all over Oregon, the largest deposits are found in Crook, Jefferson, Malheur, Wasco and Wheeler counties. The world’s largest thunderegg, a 1.75 ton specimen, is housed by the Rice Northwest Museum of Rocks and Minerals. According to legend, thundereggs were named by the Native Americans of central Oregon, who are said to have believed that these strange, agate-filled stones were thrown by fighting “thunder spirits” who dwelt on Mount Jefferson and Mount Hood (two of several snow-capped peaks high in the Cascade Range). The Native Americans believed these rival, jealous gods hurled large numbers of the round-shaped rocks at each other in fury during thunderstorms. The Rice Museum is the premier collection of rocks and minerals in the Pacific Northwest and a top destination for earth science education for individuals of all ages. 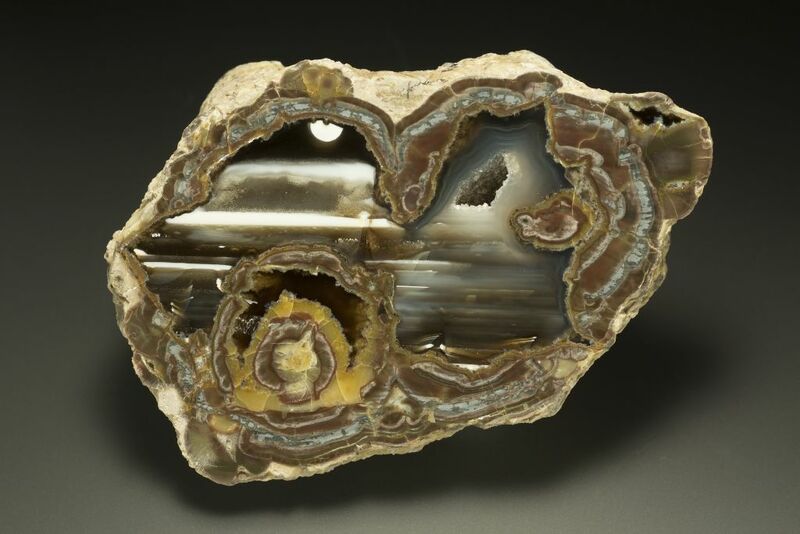 The museum collection is home to thousands of natural mineral specimens from around the world, including one of the finest rhodochrosite specimens in the world, and a collection of lapidary arts. The Rice Museum is an affiliate of the Smithsonian Institution and is set in the historic ranch-style home of Richard & Helen Rice. Completed in 1953, the house is set on 23 acres in Hillsboro. 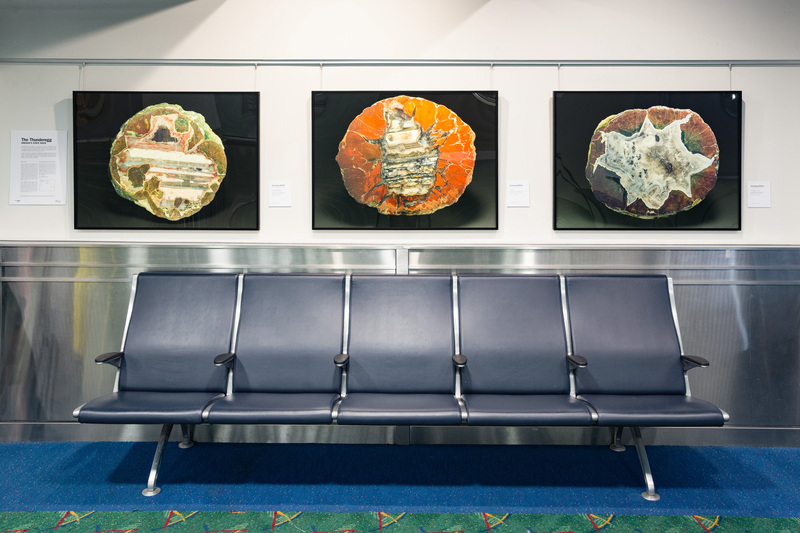 The Thunderegg photography exhibition by Julian Gray will be on view in the PDX Rental Car Lobby through December of 2018. Please visit the Rice Northwest Museum of Rocks and Minerals website at ricenorthwestmuseum.org for more information. This special exhibition was sponsored by the Washington County Visitor’s Association. Please visit tualatinvalley.org for tour packages, lodging, restaurants, and other exciting experiences near the Rice Northwest Museum of Rocks and Minerals.